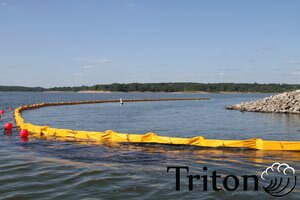 Triton Type II Silt Barriers are floating turbidity barriers designed specifically for areas with moving water, currents, waves, or tides. Manufactured in the USA with high quality reliable components, Triton type 2 silt curtains contain turbidity and displaced particles in a designated area. Triton Type 2 turbidity barriers are recommended for use in water locations with waves up to two feet (2'), moderate wind, and currents up to 1 knot. Standard Length 50 or 100 ft. 50 or 100 ft. 50 or 100 ft. 50 or 100 ft. Depth 3 to 10 ft. 2 to 20 ft. 3 to 100 ft. 3 to 100 ft.
Visit our page for Type 2 Silt Barrier to Contain Debris. All curtains have an 8" float option, Stainless Steel Components, Alternative Fabrics, Additional Fittings and Zinc Anode Additions are available for extended use or demanding locations. 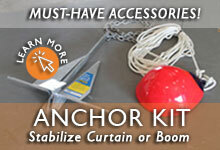 Anchor Kits: Anchoring is crucial for the success of your project. Without proper anchoring your Type 2 Turbidity Barrier WILL fail. Buoys and Marker Lights: Buoys and Marker Lights are used for demarcation and will help you in compliance. 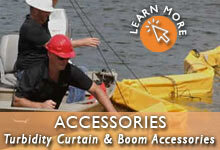 Accessories are an important component for the installation of any silt curtain or barrier. Click the link above to Learn more about these Type II silt curtain accessories, their specs, and uses. View our Ground Anchor Installation and Silt Curtain Anchoring Instructions. Importance of Turbidity Curtain Anchoring: Anchor kits and anchoring are one of the most important accessories for floating turbidity curtains in sites dealing with moving currents, waves, tides, or other site factors. Having the right anchor pattern, installation design, and anchors can significantly influence, reduce, and redistribute loads placed on your barrier and increase curtain life span. Contact our technical team at 1-772-646-0597 for more information regarding anchor placement and use. 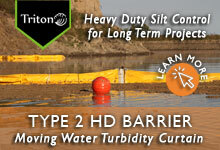 Type 2 silt barriers are typically separated into two models: Contractor and Heavy Duty Curtains. For short term projects, galvanized components can be used for a period of up to 12 months. Alternative fabrics are also available for extended deployment in areas with high pH levels, high or low temperatures, or in areas where chemicals are present. The main difference between the contractor/DOT silt curtains and the HD models are in terms of the fabric and section connectors. Contractor Silt Barriers feature a top connector plate, while HD models feature a full slide connector between each section. Depending on how much stress is placed on the curtain, different options may be better than others for your location. Anchor points and anchor methods can also play a factor in determining where the load is placed on your barrier. Please do not hesitate to contact us with your site conditions and requirements. When to Use a Permeable Silt Curtain? Permeable Type 2 Turbidity Curtains are most commonly used when they are specified in a site project or when the curtain will be dealing with a significant amount of water pressure. The bottom filter panel will help reduce pressure on the curtain by allowing water to continue to the flow the curtain. How a Turbidity Curtain Works: The main function of a silt screen or turbidity barrier is to control the dispersion of suspended silt and other particulates to improve settling times (Stokes Law). During a construction project, silt and other materials often become suspended in the water area. Silt curtains are placed within the water to create a confined zone for the contained materials. These contained areas allow marine contractors to stay within Federal and State Clean Water Act and NPDES Phase II regulations. In turn, this helps sites to avoid fines and allows projects to be completed on time. Please note, turbidity curtains are designed to act as a temporary area that increases the amount of time solids have to settle back down to the bottom of the area. They will not act as dams or walls. Knowing these elements can help determine the right anchoring strategy, curtain model, and deployment method. 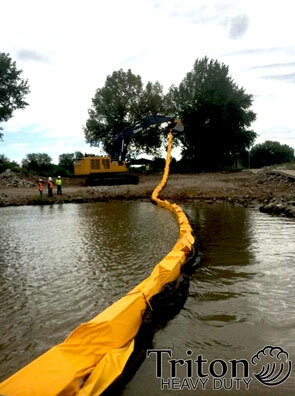 Read a customer question about whether using an impermeable turbidity barrier is right for their site. See what the EPA says about stormwater mitigation and water discharge. GEI Works is dedicated to developing innovative turbidity curtain solutions that provide superior performance and achieve the desired results for our customers. We work closely with our client team to design a deployment layout that takes into consideration all of your project requirements including water conditions, project progress, budget, and water quality goals. Our goal is to work with our clients to develop the best solution for their specific project and help them come in under budget and on time.